Last year I put hula-hoops on my classroom wish list. My co-workers wondered why, but I use them for several different things. They can be used as a way to keep centers from spreading out. The kids can sit on the outside and keep the materials inside. They can be used as bubbles around kiddos that tend to touch their friends at rug time. They work for recess, even when it's inside. However, my favorite way to use them is to create an instant Venn Diagram. I broke out my hula-hoops, had the kids sit around the edge of the rug, and used them to model comparing and contrasting. We used the books Chewy Louie and Harry Hungry! They were perfect for this lesson. Chewy Louie is about a puppy that eats everything from toys to part of the house. Harry Hungry is about a baby with an insatiable appetite. The adults in both books try to stop the destruction. Chewy Louie is teething and outgrows it. Hungry Harry is just very hungry until he falls asleep. The books paired perfectly and made this lesson very obvious for my students. They really got it and I will definitely be pulling these books out again for this same skill next year. On another note, today was big day at my house. We are getting ready for my little one's 5th birthday and today her birthday present arrived. Check out the new playground. She's in love. I think know she would move in if I'd let her. Thanks for stopping by and taking the time to read my post. I love comments. 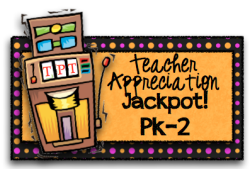 Remember, I am participating in the Teacher Appreciation Jackpot and will be reading your comments to help pick out what product from my TPT store (normally priced between $3-$8) I will be posting for free for one day only on Sunday May 8th. You can my post about the jackpot here. As a mother and teacher I realize how hard teachers work each day. I'm thankful for all of the teachers I work with, my daughter's teachers, and all of the teachers I've gotten to know online. Let's celebrate the hard work we all put into our classrooms with a party. Like any great party, this ones got gobs of goodies. There might not be cake, but it's got something even better. Freebies! So, for today only (May 6th) you can download my Sweet Tweet Spring Centers for free. They are normally $5. Just click on the picture. Don't forget to check out all of the other awesome freebies. With over 130 participants there are a lot of freebies to download, but remember they are free for one day only! Check out the linky party below. Everyone's free product is listed there. Let the party begin! With so many bloggers participating, the event has been broken down into groups. Here they are.